You may feel, Doug I don’t have to time to work on this, my leadership team and I have too much to do already. It’s common for this to be the case, especially in a mid-sized growth company. Remember the number one cause of business failure is poor decisions. Executing properly and making the right strategic decisions are closely linked. If you’re not executing properly you won’t have time to make decisions, and if you don’t have time to make decisions properly, you’re at a higher risk to make poor decisions. Executing properly is the result of following the Rockefeller Habits Checklist and Strategic Discipline. Discovering your Profit per X is a crucial step in building your Hedgehog Concept. What is the Hedgehog Concept? It’s a similar axiom to the One Thing. Based on the famous essay by Isaiah Berlin, “The Hedgehog and the Fox” describes how the world is divided into two types. The fox knows many things. The fox is a very cunning creature, able to devise a myriad of complex strategies to sneak attack upon hedgehog. The hedgehog knows one big thing, rolling up into a perfect little ball thus becoming a sphere of sharp spikes, pointing outward in all directions. The hedgehog always wins despite the different tactics the fox uses. For business the Hedgehog Concept is the intersection of three circles. More than a strategy it’s really an understanding. It’s interesting to note the difference that Jim Collins identifies in Good to Great. 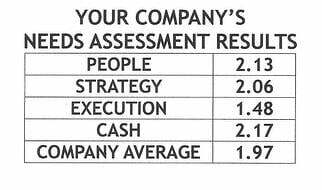 Good-to-great companies set their goals and strategies based on understanding; comparison companies set their goals and strategies based on bravado. The good to great companies are more like hedgehogs; they know "one big thing" and stick to it. The comparison companies are more like foxes; they know many things but lack consistency. What you can be the best in the world at (and, equally important what you cannot be the best in the world at). If you cannot be the best in the world at your core business, then your core business cannot form the basis of your Hedgehog Concept. This basic understanding goes far beyond core competence. A core competency does not guarantee that you can be best in the world at it. Conversely, what you can be the best at might not even be something in which you are currently engaged. What drives your economic engine? Most of the good-to-great companies discovered a single driving denominator as profit per x, which had the greatest impact on their economics. For social sector, instead of economic, resource engine – which is broken into three parts as time, money, and brand. You need to be aware that getting your Hedgehog Concept is an iterative process. Don’t expect one pass to be enough to discover it. In fact each of the three circles can take some time to complete. You may already have discovered what you are deeply passionate about. It should be hidden in or be your Core Purpose. In some companies this might be your mission statement. In reality you may find that looking at your Hedgehog Concept and particularly what you are deeply passionate about that your Core Purpose or mission needs to be reexamined. In Good to Great Collins notes that it took four years on average for the good-to-great companies to get a Hedgehog Concept. Another perhaps startling fact is that strategy did not separate the good-to-great company’s from the comparison companies. Both sets had strategies, and there is no evidence that the good-to-great companies spent more time on strategic planning than the comparison companies. So why do this? In one word: clarity. Crafting a strategy ultimately leads to clarity with your people, your vendors, your customers. That clarity translates into focus. Over time a clear strategy delivers a decisive blow to make your previous marginal efforts definitive impacts that transform the marketplace. Want to learn more about strategy and how it can impact your business? There’s just today and Monday to register to attend the Rockefeller Habits Four Decisions Workshop on November 12th. Next blog we’ll discuss more about the elements of the Hedgehog Concept, where you might have already done some work on these and why it can make a significant impact on your business growth.